Also, Jaggadal is his car. Ajantrik channels many modes simultaneously: manic slapstick, Brechtian absurdity, deeply felt commentary on social conditions. 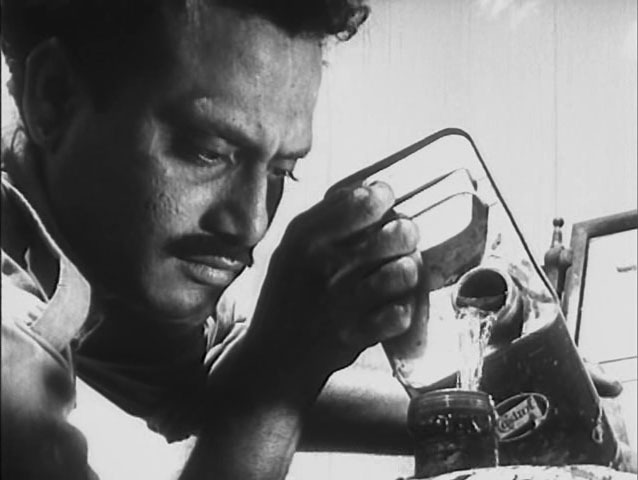 Satyajit Ray is commonly credited with founding Indian parallel cinema, mixing social realist tropes with local concerns as a quiet rebuttal to mainstream movies, but there’s a good argument that Ghatak — with his first, pre-Pather Panchali film The Citizen — got there first. Ajantrik was his second. Its influences can be felt in Ray’s Abhijan four years later, and in the general outline of Ray-devotee Martin Scorsese’s Taxi Driver quite a bit later then that. Regardless of lineage, Ghatak seemed to be up to something different in Ajantrik. The film tells the story of Bimal, a man out of place and not in sync with his time. He too is a taxi driver, but refuses to give up his beloved Jaggadal, an aging, creaking, huffing and puffing car he’s had for over a decade. In his insistence that it’s never broken down, so why should he get a new one, you can hear every stubborn man refusing the latest invention. 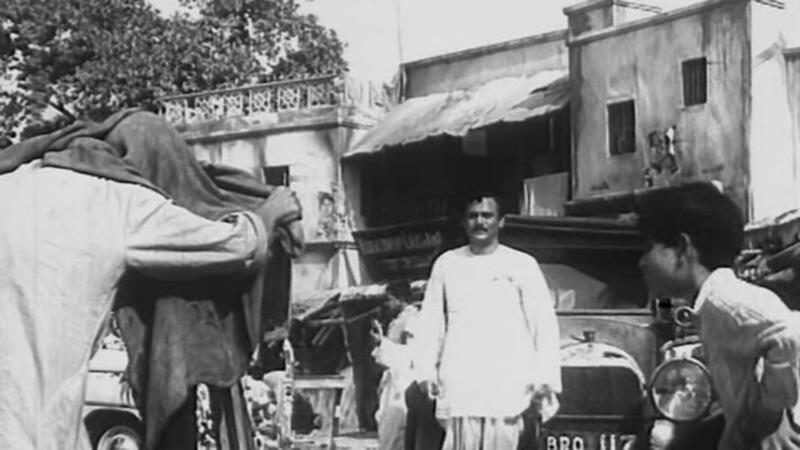 But Ghatak mines deeper: even though his beloved is, as he’s constantly reminded by his incredulous boss and mocking neighbors, “a hunk of iron and steel,” Jaggadal is also a symbol that goes way beyond its physical manifestation. It’s a bit of pre-Partition nostalgia, and his clinging to seems to represent a rejection not just of newfangled imports but modernity itself. In the scene, though, you get the sense that Bimal isn’t comfortable here, either. The observed ritual seems to evoke an even more distant past, one further remote from his struggles than his uncomfortable segue into an unsure modern age. He simply has his car, and he wants to keep it. The eroticism of the earlier scenes isn’t exactly David Cronenberg’s Crash, but the fierce merging of man and machine is evident. 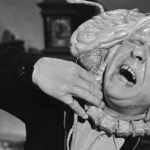 We close on a child playing with the car horn, the only piece that survived — appropriately enough, for a film obsessed with noises, the sound-making one. His delight brings a smile to Bimal’s face. Perhaps Jaggadal lives on. It could be a nostalgic vision only, except that the goofball laughs end up being played straight. 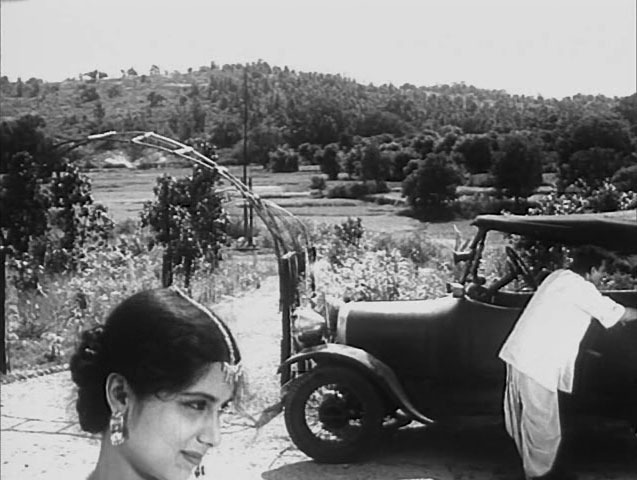 There’s certainly something silly about a man whispering to his car, but Ghatak infuses the film with so much historically specific pathos that it feels more like a eulogy. A eulogy for an inanimate fetish object, sure, but a eulogy all the same.